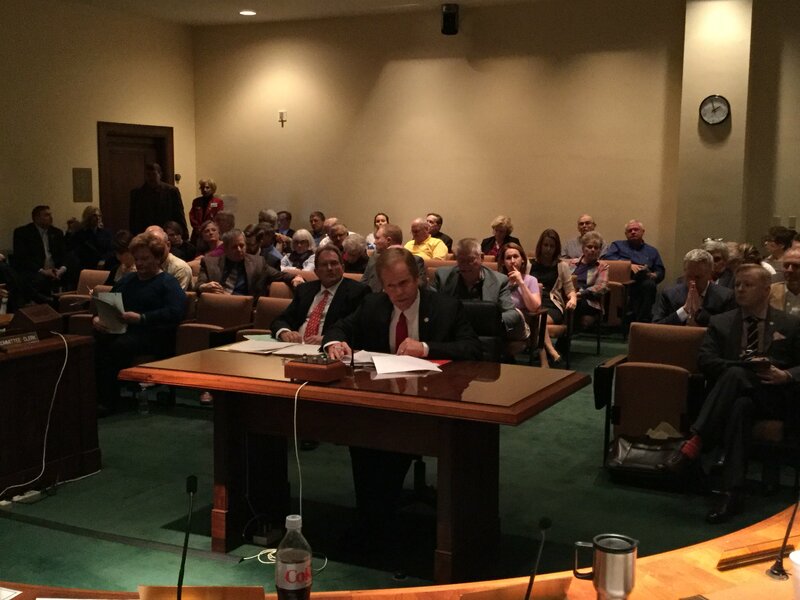 Lincoln, NE – Senators heard arguments Wednesday for and against increasing sales taxes to reduce property taxes. And they gave first-round approval to repealing a ban on teachers wearing religious garments in public schools. The state sales tax rate would rise from 5.5 percent to 6.5 percent, and the money would be used to reduce property taxes by about seven percent, under LB 313, a bill introduced by Sen. Tom Briese of Albion. Briese said Nebraskans are demanding relief from property taxes, most of which go to pay for schools, and his proposal is a realistic alternative. “There’s two routes to property tax relief: reduce spending or rebalance our tax structure and change how we pay for things. Realistically, we’re not going to be able to slash and burn our way to the property tax relief our residents are demanding,” Briese said. Briese’s proposal would take the estimated $300 million a year from a penny increase in the sales tax and use it to fund a property tax credit. That credit would benefit people in proportion to the property tax they pay, so some of the largest benefits would go to farmers and ranchers. Some of the increased tax revenue would be used to cushion the impact of increased sales tax on lower income taxpayers, by increasing the earned income tax credit. Briese took issue with how some opponents have characterized his plan. “Some folks may try to call what I propose in LB 313 a tax increase. I believe it’s disingenuous to do so. A tax increase is raising additional revenue and spending it on programs. All dollars raised by LB313 are to be directed back to taxpayers in an effort to provide more fairness and balance in our tax structure,” he said. Sen. Burke Harr of Omaha expressed concern that like many tax changes, the proposal could benefit the top and bottom 25 percent of income earners. “Somewhere the middle guy – the working poor and the middle class — maybe just a little above middle class – they’ve been left behind. And I’m fearing that we’re going to (have) tax relief for the rich, maybe hold harmless for the bottom. It’s that guy in the middle – the working class guy, blue collar guy – that’s going to end up picking up the tab for this,” Harr said. And Sen. Lydia Brasch of Bancroft said merely shifting taxes won’t provide overall relief when spending by schools and local government continues to grow. “I do think that increasing a tax in an effort to reduce a tax when there is a base that shows nothing but growth in financial needs, and without restraining that, you’re just going to keep getting that balloon bigger and bigger. You’re getting the helium from somewhere else,” Brasch said. The Revenue Committee also heard testimony on proposals to expand the sales tax to more services in order to fund property tax relief. And in legislative floor debate Wednesday, senators once again took up Norfolk Sen. Jim Scheer’s proposal to abolish Nebraska’s century old ban on public school teachers wearing religious garments in school. Scheer said the idea was brought to him by a nun who wanted to substitute teach in the Norfolk public schools, and was told she could not if she wore her nun’s habit. Scheer, a former member of the Norfolk school board, said most people don’t know the ban exists. “This has been on the books for almost 100 years. It has never been enforced. There’s never been one case of anything remotely related to this statute ever being taken up,” Scheer said. Omaha Sen. Ernie Chambers opposed Scheer’s proposal to repeal the ban. Chambers said there should be complete separation of church and state. “There should be no person standing in front of a classroom wearing the garb, the paraphernalia, the dress of any sect, religion or denomination. After all, this is America. There should be no favoring of any religion,” Chambers said. Lincoln Sen. Adam Morfeld said the current ban could hurt some of his constituents who wear traditional Muslim headscarves. Chambers argued if families can’t afford private schools, they must attend public schools, and should be protected from adult religious disagreements. “Those children need to be shielded and protected. Let me argue with these grownup Catholics. And let these grownup Muslims argue with grownup Jews. And let us all get together and fight with each other. But don’t bring it into the classroom where the children are. You all are using the children as pawns. This is a religious issue, and it’s a Catholic issue here,” Chambers said. When the vote came, Chambers stood alone in opposing the bill, which got first round approval on a vote of 36-1.